How do you quickly and easily delete blank rows or columns in your data? This is a handy trick to know if you’ve ever come across a large set of data that for some reason or other has a lot of blank rows. 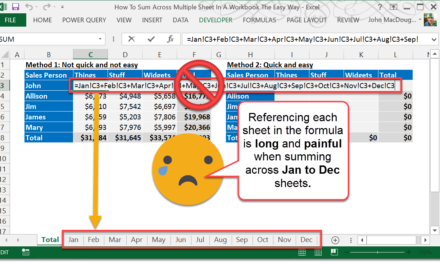 Blank rows can make it more difficult to work with the data. If there are just a few rows, you could manually go through and delete them one at a time. 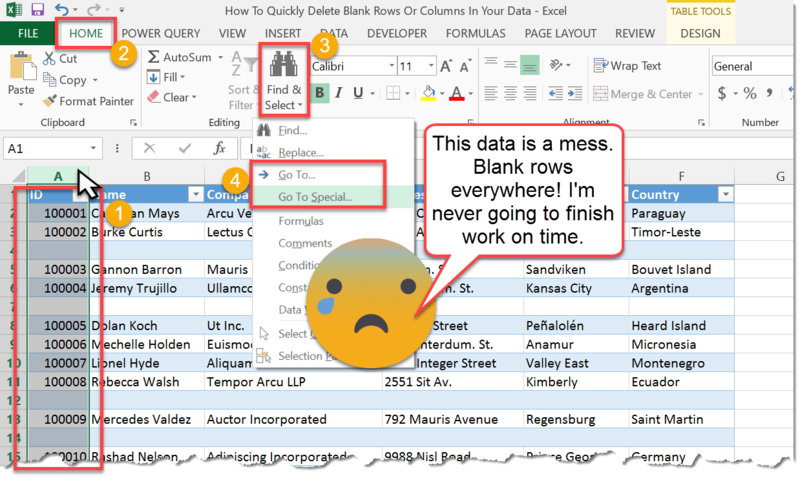 But if there were a few hundred blank rows and you wanted to delete them, that would take a while… There is a quicker way! 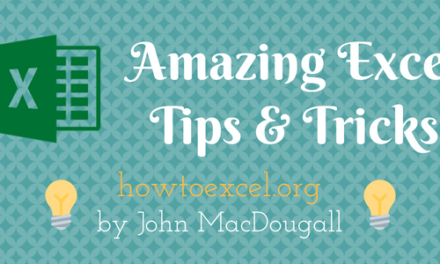 Highlight a column in the data and open the Go To window. Right click on a column grid heading in your data to highlight the entire column. You can also use the Ctrl + Spacebar keyboard shortcut to highlight an entire column, this will highlight the column the active cell is in. Press the Find & Select button. Select Go To or Go To Special from the drop down menu. If you select Go To, you will have an small extra step and take get to the Go To Special menu. 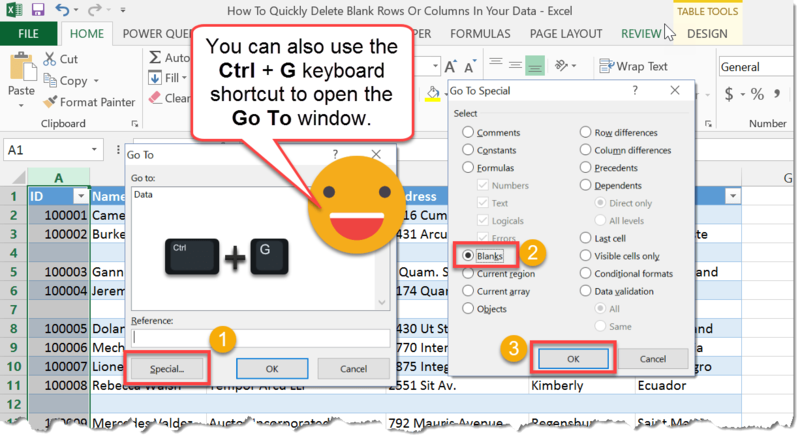 You can also use the Ctrl + G keyboard shortcut to access the Go To window. Select the Blanks radio button. Now only the blank cells in the column you highlighted will be selected. 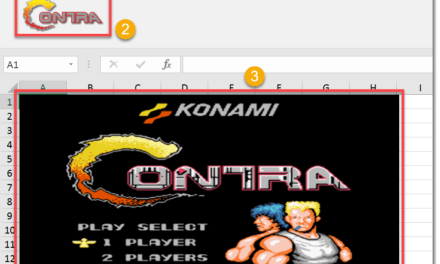 Hover over one of the selected cells with the mouse and left click. 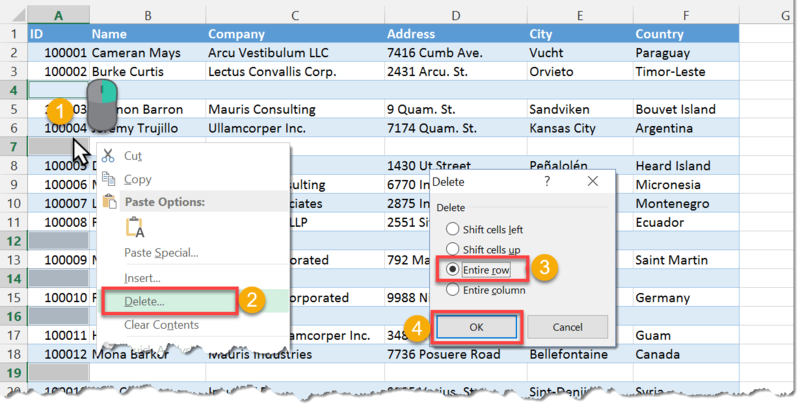 Select Delete from the drop down menu. Select the Entire Column radio button. A similar trick will work for blank columns, just select Entire Column instead of Entire Row. Voila! You just saved yourself a tonne of tedious work. Go take a 15 minute break and relax, you’ve earned it.